As writers and creatives, the problem is rarely ‘I have no ideas’. It’s usually quite the opposite and we get inundated with the damn things. 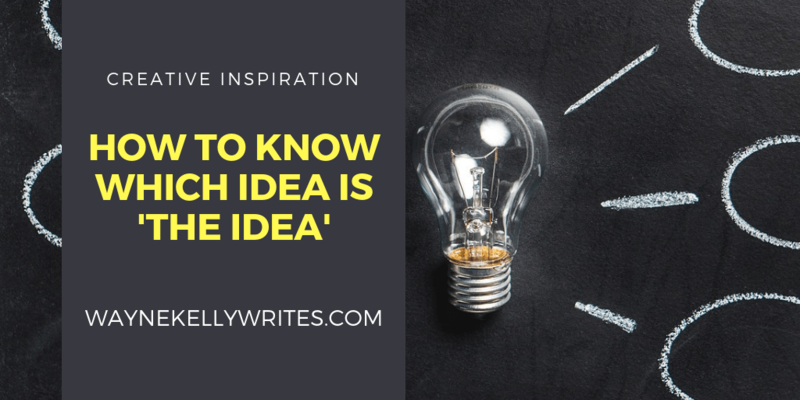 So how do we know which one is ‘THE IDEA’, the one that has the legs, the depth and the originality to be worthy of our valuable time? It’s a topic that surfaced again for me recently and also something I discussed with author, Melanie McGrath on the most recent episode of The Joined Up Writing Podcast. For the past few months, whilst working towards finishing the final edits (before submission, anyway!) on my novel SAFE HANDS, one of these ideas has been bubbling away in the back of my mind. At first, I pushed it away – after all, Safe Hands was always going to be a standalone – right? I’ve got at least two other books waiting to be written and it was time to leave Mickey Blake and his troubles behind me. And yet . . . something tapped away on the inside of my skull, trying to get out. I started to notice other strange things too . . . Editing the novel has meant reading, reading and re-reading my story, ironing out kinks, filling in plot holes and killing scores of ‘my darlings’. But the more I read, the more I noticed a strange phenomenon. Bits of Mickey’s backstory – although pertinent to this book – kept seeping in and leading me toward the conclusion that Mickey has at least one more tale to tell. A trail of breadcrumbs that I seem to have subconsciously dropped into the text. Things related to a big heist that took place before Safe Hands, a safe deposit box and a powerful antagonist desperate to get it back. You Just HAVE to write it! I resisted for months until one day a couple of weeks ago, when I awoke at 5am and couldn’t go back to sleep. My mind was alive with ideas for the follow-up. I crept downstairs, opened my laptop and brain-vomited everything into an excited email to a writing friend. I had a working title – BOX 337 – plus new characters, a location, an opening scene and lots and lots of possibilities but – most importantly, a burning desire to actually write the thing. This isn’t a casual fling, a one night stand. I can’t get it off my mind. Even though I usually write by the seat of my pants, I’m even considering trying to outline the whole thing. It’s serious. So, when you’re deciding which of those flirtatious stories or characters to settle down with, ask yourself: Am I ready for that level of commitment? Do I want to spend several months or years of my life with this story? If my descriptions of infatuation resonate with you, chances are you should seriously be considering the new idea as marriage material. You simply HAVE to be with him/her and are willing to settle down for at least the time it takes to finish your first draft. For me, it’s non-negotiable. I just HAVE to write it. But what about you – are you ready to ‘go steady’ with one of your ideas yet? How do YOU know when the time is right? Let me know in the comments and don’t forget to subscribe to the mailing list to get a free short story and future bonus content from my books and stories.